Tarsal tunnel syndrome is the result of a nerve compression in the foot, causing symptoms in the sole of the foot, toes and/or heel. The diagnosis is still often missed. The condition is increasingly common in runners and people who play a sport that involves a lot of jumping. However, it can affect anyone. 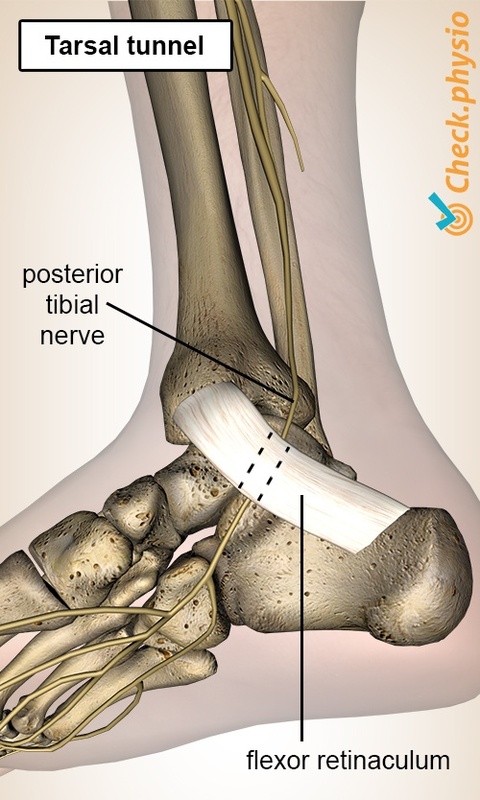 The nerve that we call the "posterior tibial nerve" runs along the inside of the ankle through a type of tunnel. This is called the tarsal tunnel. The nerve is accompanied in the tunnel by a number of tendons and blood vessels. A strong fibrous band, called the flexor retinaculum, keeps everything in position from the outside. The inner side of the tunnel is formed by the bone tissue of the foot. 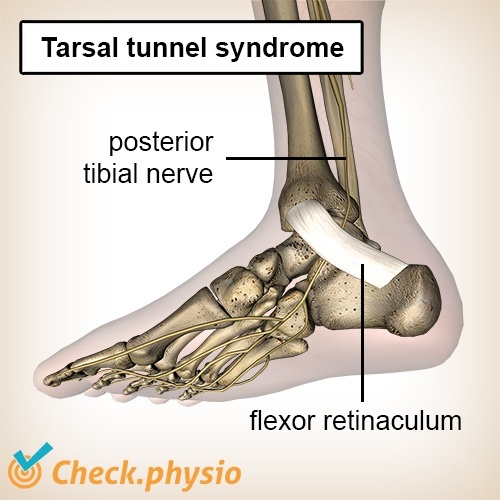 In the case of tarsal tunnel syndrome, the posterior tibial nerve becomes compressed in the tunnel. There are various causes and this can result in symptoms over the course of the nerve. The symptoms can develop either gradually or acutely. There are many causes that can result in a narrowing of the tarsal tunnel and subsequent tarsal tunnel syndrome. Examples include abnormal position of the feet, swelling or thickening of structures, shoes that are too small, bone fractures, sprains and overloading. Pain, numbness, pins and needles and/or a burning sensation on the inside of the ankle. The symptoms radiate to the underside of the foot, heel or toes. Prolonged standing, walking or running makes the symptoms worse. The symptoms usually disappear when in rest. However, nocturnal pain can occur. Wearing tight shoes can make the symptoms worse. Sometimes there is a cramping sensation on the inside of the ankle. In some cases the symptoms radiate to the inside of the calf. The diagnosis is made based on the patient's story and the physical examination. The nerve is stretched and pressure is applied to provoke the symptoms. Additional examination can consist of nerve conduction examination to check how well the nerve is able to conduct stimuli. The tarsal tunnel can also be imaged using MRI, to determine the cause of the compressed nerve. Tarsal tunnel syndrome is generally treatable. There are various treatment options, depending on the cause of the nerve compression. The treatment can consist of physiotherapy, medication, a corticosteroid injection, modifications of the shoes, a temporary brace, splint or crutches or modifications to weight-bearing activities. Unfortunately this does not always result in improvement. If conservative treatment does not alleviate the symptoms, surgical intervention can be considered. Such a procedure relieves the pressure on the tarsal tunnel and frees the nerve. The surgery is generally very successful.